Sterling Silver 7.8mm Tiny Ohm Stud Earrings, .9mm Post Thickness, Clutches Included. Order 2pcs to get one pair of earrings. Ohm Sweet Ohm. 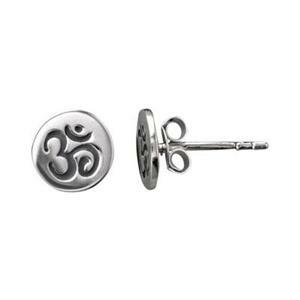 Yoga lovers and travelers will appreciate our SNE38 – Tiny Ohm Stud Earrings! Bright Cast Sterling Silver with the imprint oxidized antiqued to bring out the detailing. Perfect for wearing at Ohm, er home that is, at the office or out to play!